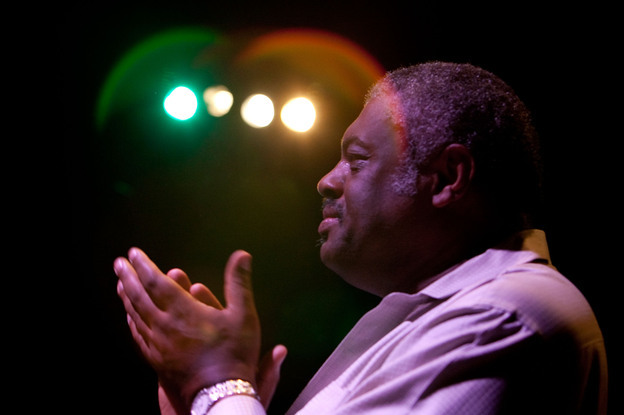 Mulgrew Miller, whose supple touch and thorough command made him a leading jazz pianist, died early Wednesday. His death was related to a stroke he suffered a week earlier, according to saxophonist David Demsey, coordinator of jazz studies at William Paterson University in Wayne, N.J., where Miller served as director of jazz studies. Miller was 57. A versatile player, Miller had a style that sparkled with clarity and bounded with soulfulness — a combination that can be heard on more than 500 albums, by his own estimation. His gentle personality and thoughtful mentorship further endeared him to multiple generations of musicians. “He was a very positive kind of human being,” said Steve Wilson, a saxophonist and close associate. “He never had anything negative to say about anyone or anything. … But the second he sat down at the piano, he was in the zone. Whether he was at soundcheck, or trying to see if the piano was in tune, or at a gig — whenever he played that first note, he was in that zone.” Miller was born in 1955 in Greenwood, Miss. and his father bought him a piano six years later. At 14 he saw Oscar Peterson play on TV and was smitten by jazz. Miller studied at Memphis State University and in Boston, then spent the next two decades as a full-time touring professional. Among his highest-profile associations were with the Duke Ellington Orchestra (under the direction of Mercer Ellington), singer Betty Carter, trumpeter Woody Shaw, drummer Tony Williams and drummer Art Blakey, whose band served as a development academy for star young talent. Though Miller recorded much more as a sideman than a bandleader, he left behind an estimable solo discography of well over a dozen albums. He released his debut recording in 1985; two years later, he released Wingspan, which shared its name with the band he led off and on. In recent years, Miller also performed frequently with a trio of younger musicians (Rodney Green on drums and Ivan Taylor or Derrick Hodge on bass), and was often spotted with bassist Ron Carter’s Golden Striker trio, a drummerless ensemble with guitarist Russell Malone. Miller was recorded often by the NPR Music program JazzSet, produced by member station WBGO. His trio visited the Kennedy Center in Washington last year, and a Detroit Jazz Festival performance found him leading Wingspan and duetting with fellow pianist Kenny Barron. Before Miller died, he also saluted his colleagues. He can be heard in a JazzSet recording of a tribute to pianist James Williams, whom he knew since his college years in Memphis, and who preceded him as a professor at William Paterson.